Right off the lot the Chevy Silverado truck is built to get through all sorts of terrain. To get even better clearance, having a lift kit installed is essential. Aside from increased ground clearance, a lift kit enables you to fit bigger tires on your big mother trucker Silverado! Check out the full article below for the 5 best Chevy Silverado lift kits. Let’s face it, the market is full of different lift kit models from different brands. This makes shopping a daunting task. For starters, it is difficult to tell the difference between a genuine versus cheap lift kit. Also, each lift kit has multiple features and this makes the task of selecting the best list kit for your Silverado more challenging. To help you with this, I will be reviewing the 5 best Chevy Silverado lift kits that you can have quick-shipped to your house today (from Amazon, of course). In the article, I will highlight the advantages of owning the best lift kit. Later on, I will recommend my choice of lift kit to every Chevy Silverado owner. If you don’t want to read the full article and just want to see our top-rated lift kit, click here now! There is something special about driving a miniature version of a monster truck. Not only are you able to travel off-road on bumpy terrain with ease but you can drive on-road as well, albeit well above everyone else around you. To help you make a smart decision when shopping for the best lift kit, here are 5 key features of a lift kit you should know about. A lift kit improves visibility when on the road. It also comes in handy when driving in congested areas. Sitting higher allows you to notice other drivers and have a better view of the road. Also, you can watch out for other road users – pedestrians, bikers, and cyclists – a lot easier. As I said earlier, a lift kit increases ground clearance for your Chevy Silverado truck. By doing so, you have the option of installing bigger tires. This comes in handy when driving on bumpy terrain – for example along a rocky road or flooded road. There are Chevy Silverado owners who prefer having larger tires on their pick up trucks. Not only does this improve the pickup’s appearance but it provides better traction. As a result, the driver is able to stay in control especially when driving on slippery roads. Pickup trucks have powerful engines capable of generating a lot of horsepower. As a result, they are used in towing and hauling heavy loads. Whether it’s a boat or another pickup truck stuck in the mud, your Chevy Silverado pickup truck can tow or haul the load once it’s fitted with the best lift kit. If you drive from home to work and back over bumpy terrain, installing a lift kit on your pickup truck makes your journey a pleasant experience. Thanks to the improved ground clearance and bigger tires, your pickup truck will have better traction. Also, your sitting position will be higher allowing you to watch out for other drivers and road users. 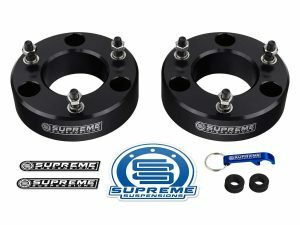 Supreme Suspensions is a renowned brand and market leader in the lift kit industry. For many years, the company has manufactured high-quality lift kits for Chevy Silverado pickup trucks. 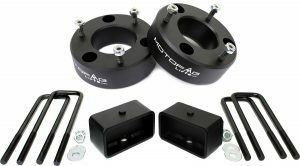 Case in point, the Silverado Lift Kit 4WD Adjustable 1″ – 3″ Front Lift Carbon Steel Max-Torsion + 2″ Rear Lift Solid T6 Aircraft Billet Lift Blocks (Black) Silverado Leveling Kit PRO. Precision engineered with carbon steel, this lift kit has two cold forged carbon steel Max Torsion keys and two solid aircraft billet lift blocks. The Max Torsion keys are CNC machined from T6 Aircraft Billet solid blocks. This material was chosen due to its sheer strength which is a plus as it helps to position your truck at a higher ground clearance. What I discovered is that each Max Torsion key has received a special anodized coating. This superior finish not only improves the look of the keys but it protects them against corrosion and rust. Also, the use of solid blocks assures you that the lift kit will not warp under the heavy weight of your pickup truck. Thanks to the high-quality build, the lift kit provides a 3-inch front lift and a 2-inch rear suspension lift for your pickup truck. This model fits 1999 to 2006 Chevy Silverado 1500 4WD and the classic body style 2007 Silverado 1500 4WD. MotoFab is another industry leader in lift kits. The company is renowned for producing lift kits with 100% satisfaction guarantee and lifetime warranty. Each lift kit is built in the US assuring you of a top quality product. CNC machined out of billet aluminum blocks, the end result is a high-quality product. Not only can this lift kit withstand the heavy load of your Chevy Silverado pickup truck but it will not bottom out when towing or hauling heavy loads. The rear spacers are fabricated with longer U bolts and lift blocks. These fabricated lift blocks for the rear are long-lasting. Not only can they outlast cast iron models but aluminum ones too. 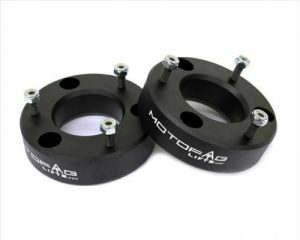 The rear spacers are also powder coated to protect them from corrosion and rust. As one of the easiest lift kits to install, I took 1 ½ – 2 hours to install it. Besides, you do not need to use a strut/coil disassembly like other lift kits. The front spacers are powder coated too. This gives the components a long-lasting finish. Also, it helps to protect the spacers from rust and corrosion. As one of the strongest lift kits, it comes complete with installation instructions and hardware. Fits 2007 to 2018 Chevrolet and GM 1500 Pickups. 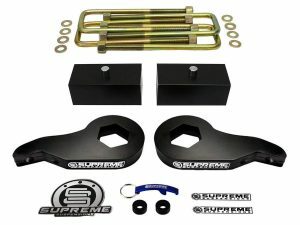 Just like other Supreme Suspensions lift kits, this is a solid model. You don’t have to worry about it giving way especially when your car is traversing rough terrain. The kit is built with high strength carbon steel and features CNC machined aircraft billet made from aluminum alloy blocks. A special anodized coating is applied to both the front and rear spacers. This provides protection against elements. Also, it offers superior resistance to rust and corrosion. The lift kit has been tested by Supreme Suspensions in-house ASE certified specialists. A team of independent specialists was included in the testing and so, you are assured of a quality product. When it comes to installation, it is easy as 1..2..3. No special tools are needed to mount the lift kit. It only takes less than 2 hours to install the lift kit. In the package, there is the installation hardware, instructions, and the Supreme Suspensions Pro pack. If you are looking for a lift kit that will raise your Chevy Silverado pickup truck by 2.5 inches, then I recommend this lift kit to you. Precision CNC machined from billet aluminum blocks, the front spacers are powder coated black to match your pick up trucks stock suspension. The powder coating has another function – to offer protection and resistance against corrosion and rust. Having taken a look at the kit, I can assure you that the quality cannot be compared to welded spacers. As you already know, welded spacers are susceptible to cracking which is not a good fit, especially for a pickup truck. This lift kit is the strongest in the market and comes with a 100% satisfaction guarantee. Also, you should find the installation instructions and hardware in the package. This model fits the 2007 to 2018 Silverado/Sierra 2WD and 4WD. Remember, the lift’s spacer thickness does not translate to a 1 to 1 ratio. This is because of the suspension’s geometry. 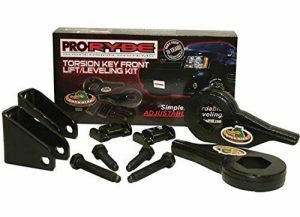 Speaking of leveling lift kit companies with an excellent reputation, ProRyde has been producing innovative automotive products since 1980. They have supplied suspension geometry components to automotive distributors in North America for over 3 decades. This lift kit is indexed to your liking, unlike other models which offer only non-adjustable solutions. As a premier lift kit, it comes with components that raise your Chevy Silverado higher than the factory stock. That means, your pick up truck will have more ground clearance and so, you can install bigger tires for off road and on road driving. Built with high-quality materials, the lift kit is long lasting and offers excellent off-road cushioning. Also, it offers better sitting clearance, an added advantage as you will have a better view of the road and other drivers. In the package, you should find everything that will make this lift kit work. This model fits a Chevy Silverado 1500/2500. 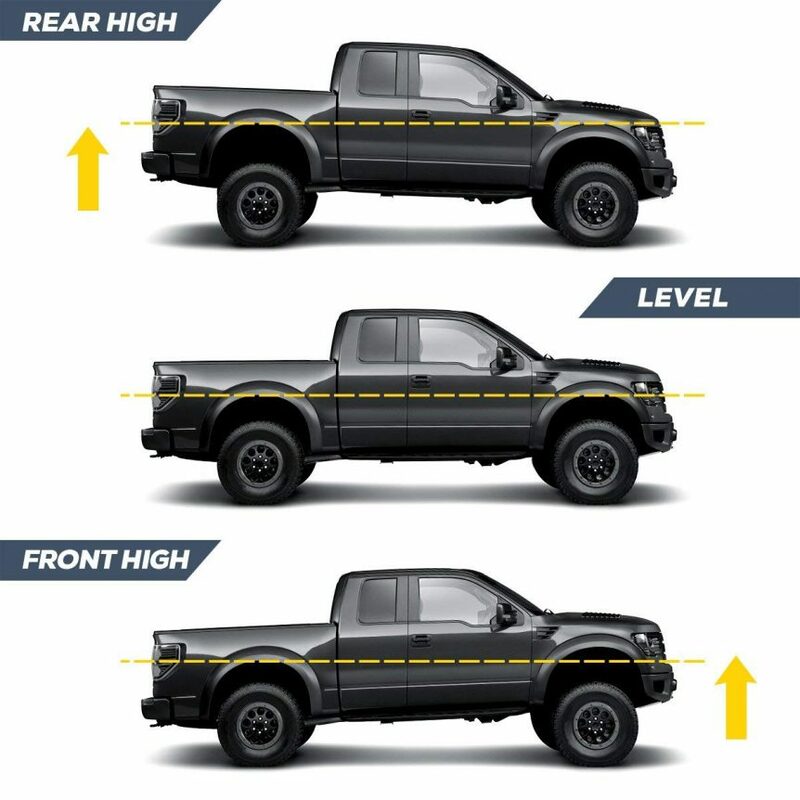 If you are in search of the best Chevy Silverado lift kits, then any from my list will do but if I were to pick a clear winner, my choice would be the Silverado Leveling Kit PRO. Here is why – for starters, I love leveling lift kits from Supreme Suspensions. As a company with an excellent reputation, all its lift components are precision CNC machined from aircraft billet, which makes them durable for even the most gnarly off-roading. Not only does this guarantee you of a high-quality product but it can withstand the weight when towing or hauling heavy loads. Each component has a special anodized coating that gives it a superior finish. Also, it protects the components against corrosion and rust. That is not all – this lift kit is super easy to install. Actually, it took me less than 2 hours and no special equipment is needed. Overall, I recommend this Chevy Silverado lift kit for pickup truck owners.